The Gainsborough-based Dad's Army team who won the veterans' title. A football team from Gainsborough are celebrating after winning a regional event that is part of the FA People’s Cup. The People’s Cup competition, which is in its fifth year, is the biggest five-a-side tournament in the country and is run by the FA in partnership with BBC TV’s Get Inspired initiative in association with its coverage of the real FA Cup. 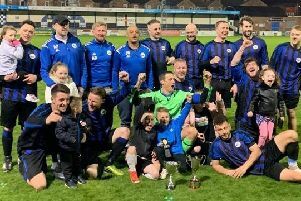 More than 35,000 players take part in 18 different categories, and a Gainsborough-based team calling themselves Dad’s Army have been crowned over-35 veteran champions in the Lincolnshire and South Sheffield region. They also got the final two years ago, but contested this year’s event, held in Sheffield, more in hope than expectation after their side had been badly hit by last-minute illness and injury. Now they are through to the national semi-finals and hope to progress even further to the national finals, which are to be held at St George’s Park in Burton-on-Trent, the £105 million facility that is the home of England’s 28 national football teams. The five teams at Sheffield played each other once in fast and furious ten-minute games that yielded a high standard of football from the ageing players. Dad’s Army started with a goalless draw, but followed up with a 2-0 victory and after another 0-0 stalemate, they won their fourth match in convincing style, 3-0, to qualify for the final. In that final, they conceded their only goal of the competition, but a composed display, in which they called upon all their vast experience, earned them a terrific 2-1 win and the trophy. Manager John Anderson was over the moon with his team. He said: “What a brilliant result, gained by a team of fantastic players. They deserve all the credit for this victory. “Gainsborough has always had a strong footballing heritage, and this team has added to that. In Stephen Hunt, Andrew Markham, Barry Owen, Alister McGuire and the legendary Neil Farrow, we have a team the whole town can be extremely proud of. And not forgetting John Myskiw, who must be the best kit man this side of the River Trent!